Sales and service are being radically redefined like never before. With buyers now in possession of unlimited information, online content is quickly becoming the dominant driver for commerce. Today anyone working in sales or customer service needs to possess entirely new skills. Unfortunately most organizations are still using traditional selling and service models developed for a different time. In this new book by the author of the #1 best seller The New Rules of Marketing & PR, David Meerman Scott demystifies the new digital commercial landscape and offers inspiring and valuable guidance for anyone not wanting to be left behind. Rich with revealing, first-hand accounts of real businesses that are charting this new territory and finding astounding success - a bicycle manufacturer that engages customers with honest and revealing openness; an enterprising network of home basement repair contractors that educates clients with free publications and innovative visual software; and an independent physician who provides her patients with online video notes to help them follow detailed medical instructions - The New Rules of Sales & Service shows how innovative businesses large and small are discovering new opportunities, strengthening customer loyalty, and mastering real-time buyer satisfaction. Required reading for any organization that interacts with the public - ranging from independent consultants to established large corporations and small businesses to new start-ups and non-profits - The New Rules of Sales & Service is the essential guidebook for anyone attempting to navigate the exciting and evolving digital landscape. Note: The New Rules of Sales & Service is neither an update nor a sequel to The New Rules of Marketing & PR; rather it complements the earlier book. Each book focuses on and outlines different strategies: Marketing and PR use online content to reach many buyers at once; Sales and Service use online content to reach buyers one at a time. The New Rules of Sales & Service tailors its strategies and tactics to reflect this difference. 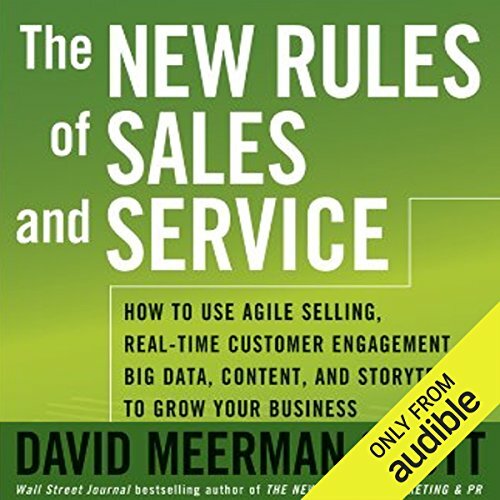 ©2014 David Meerman Scott (P)2014 Audible Inc. This book is basically saying one thing - the world have changed and you must adapt; in this case the world of sales, services, and of course marketing. Control shifted to the hand of the customer, who now has independent access to knowledge that previously was held by the sales person, who now wants the best for the money and want it right now. Now, if you want to sale you must be agile and highly responsive, you must give real service as and when needed by the specific client, you must give real, valuable and timely content, you must have a good story and tell it well. For me, this is the essence of the book in one passage. However, in order to understand that well and in order to know how to implement that well, the book is certainly worth listening to. David makes some great points - many of which should be quite obvious but until they are restated they don't take on that "duh, we should have done that" moment. Sales and marketing need to work together and DMS makes so many points on ways we can accomplish that for stronger sales results. Outstanding book. I highly recommend it to business owners and sales people. I was trained in marketing, advertising, and sales in the eighties so this book was a much-needed update on how to grow my company using today's marketing tactics. As I was reading the book I started to implement the suggestions laid out in this book. I am already seeing great results and plan to continue with David's recommendations. David has great content written in an easy to listen to and understand format. plenty of stories and examples to demonstrate the ideas. while many gurus are full of fluff, David presents real guidelines and ideas that you can actually implement and will get results. a must read for anyone in business. Information that I will put to use. Did get a bit long but would recommend to listen to. Couldn't have asked for a more comprehensive and poignant introduction to social sales. My personal and professional life will be permanently better because of Mr. Scott's work.